the wood clean and splinter free, the sun shining silken up above. is that my head going up? we are art but not apart. calligraphic ink is sinking into me like fangs. have you come to buy my wares? all the winter’s nights and all the summer’s days. come amongst us go among you and – oh – just come and go. mean to be a man? yours that you have loved that I have never even known. just as the individual sexual sounds of every lover are unique. when you admit that you have indulged in hope. Generously, I was able to take part in the Art, Not Apart Festival this past weekend, a challenging, beautiful, joyful, breaking celebration of art in many forms with many faces. I had a song stuck in my head the whole day, and a rising falling element of panic attack and heart swollen love joy skittle-gasm. I felt the sounds of screaming in the everyday at some points, and in other places I was – literally – moved to tears by the kindness and light hearted feeling of people. 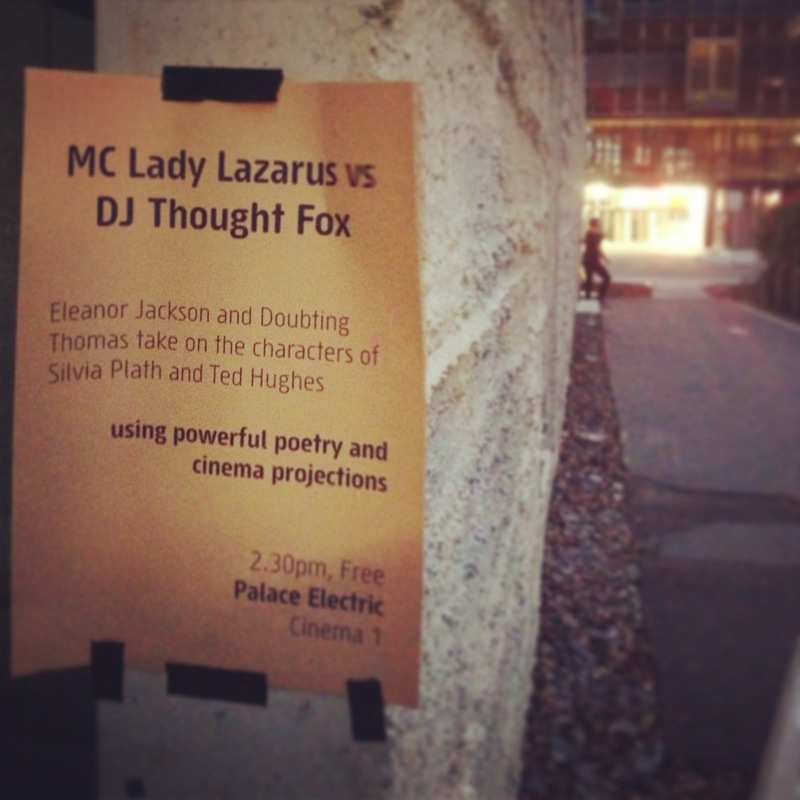 DJ Thought Fox vs MC Lady Lazarus felt slain and pulled apart to be in the Palace Cinema space, beautifully assisted by Paul who made the things just come together in the lush electric cinema. Then I told the very best story I know, which reminds me always that I feel drunk on sentiment and hungover on reality. That’s what I call a festival, a celebration in favour of the gods, in favour of the food and flavour. PS Sylvia, I know you spell it with a “y”, so don’t be coming down and haunting me in bed, with your black booted fascists, okay?